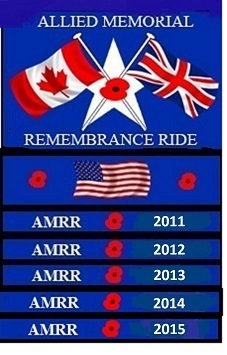 THE CANADIAN VETERAN FREEDOM RIDERS MEAFORD, ONTARIO UNIT INVITE ALL GENERAL PUBLIC MOTORCYCLE ENTHUSIAST TO THEIR 3RD ANNUAL-ALLIED MEMORIAL REMEMBRANCE RIDE. Free – Bandanas and Camouflage wrist bands to each registered participant. 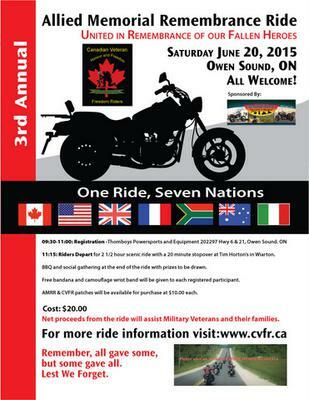 ALL REGISTERED MOTORCYCLE RIDERS FOR THIS EVENT WILL DEPART THOMBOYS AT 11:15 HRS FOR A BEAUTIFUL 2 ½ HOUR SCENIC RIDE LEAD BY THE CANADIAN VETERAN FREEDOM RIDERS, WITH A 30 MINUTE STOPOVER AT TIM HORTON’S in WIARTON. Check out the following websites for more information along with the attached flyer. 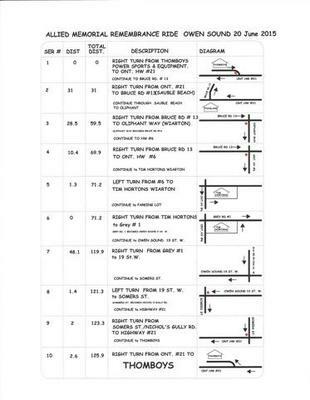 We look forward to seeing you all in June 2015.